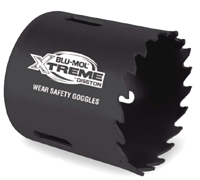 Blu-Mol has been making hole saws since 1840. The Carbide Series efficiently cuts abrasive material with greater heat and wear resistence than Bi Metal (HSS) saws. It has an aggressive cut with three teeth per inch.